This, “why didn’t anyone tell me?” and, “why isn’t anyone talking about this?” is a common refrain echoing in the postpartum tales of many mothers. So, why don’t we tell them? Or, what can we actually tell them? Is there a way to really do so? I kind of think there’s not. Nobody told me… You look at me bewildered, eyes grey with exhaustion. Milk-spattered, baggy clothes, hair awry. “Nobody told me…” you begin. You look at me, urging me to explain myself. How could I have kept this, all of this, secret from her? Surely it was my duty to prepare her. “Nobody told me how much it would hurt, how exhausted I would feel, how much love I have in my heart that I think I will burst, how overwhelming it all is…” her eyes begin to well with the enormity of her new knowing. All I can do is to smile. To hold her. “We tried.” I say softly. Stroking her tousled hair. And I think to myself. It is not so much that we did not tell you, as you could not hear. Until you have your own child, held in your heart, your ears are blocked, your eyes are blind to the reality of motherhood. Its pains and its glories. Once you have been there, stood in the body of motherhood, then you can hold hands with every woman who has ever mothered. You know her joys and pains. You are her. First baby: tender triumph and dazed reality. In response to the Blissful Motherhood life coach, another woman responded: “I remember my mom trying to get real with me before I had my first baby and I was horrified with what she told me, almost angry that she would try to burst my bubble… then I had my little boy came along and I wondered why she hadn’t told me more…Sometimes the realities of motherhood do just seem too harsh to share…” Personally, I didn’t want to hear much about the realities of parenting from my own mother, because if her experience of mothering was terrible, HELLO, that would have been my fault. I didn’t want to know that I’d made her suffer and stress! My own childbirth educator simply told a story: when her own first child was a newborn, sometimes the baby cried so much and so long, that the educator would put her down in the middle of the living room floor and go outside and run around the house multiple times. While initially only “hearing” this story in brief passing (i.e. I’ll never feel that way), I touched back in with that story multiple times during my first son’s first year. I never actually did the running, but what the story gave me was permission to feel badly about parenting and to want to get away from it. And, you know why? Because that childbirth educator was a rocking cool lady and if someone that rocking cool had to “lose it” and run around her house like a freak, then I must not be doing such a bad job myself. However, I also don’t tell them, those sparkling, beautiful, bright, glorious, happy, and full of promise pregnant women, what it is really like, because I don’t want to ever be the one to steal their joy, their excitement, their sense of promise, and their happy anticipation of “the greatest days of their life” or the fulfillment of a lifetime dream of parenthood. And, guess what? I think I’ve also realized that that sense of promise and anticipation is reborn, at least in part, during every pregnancy. It isn’t only the territory of the blissfully unaware, it is a gift that accompanies each new baby—the dream that this baby will be wonderful and perfect and so, too, can you be the mother you’ve always imagined being. It is a new, bright, hopeful start, every time. It wasn’t actually until I had Alaina that I felt like I finally really enjoyed having a baby and being a mother the way I’d always dreamed of. It wasn’t that I didn’t enjoy the others, I certainly did, but not in that delicious, complete, whole, and vibrant way in which I reveled in her. She was the first baby for whom I felt fully capable of totally giving myself to and not feeling captive by that gift. Perhaps not coincidentally, she was also the first baby for which I did not quit doing other things I wanted to do in order to mother her. My first son’s birth necessitated essentially totally dismantling my previous life and identity. It was SO HARD. I felt so much grief and loss about abandoning so much that I’d cared about so deeply. With my second son, I was finding my legs as a mother-person and feeling my way into other roles and responsibilities that were compatible with motherhood. My feelings of depression and fatigue after him were lifted when I started to find my voice as a blogger, as the editor of the Friends of Missouri Midwives newsletter, as a breastfeeding counselor, and as a birth educator. I’d redefined myself to include motherhood as the core facet of my identity, but in a way that allowed me personal expression and the ability to “make a difference” to other women. With my last baby, my mother-voice outlets were firmly established, my tribe was healthy and strong, and my non-mother career was compatible in an integrated and fairly harmonious way with family life. It was then that I finally felt like being a “good mother” AND doing others things at the same time was actually possible and (pretty much) stopped trying to make excuses for never having given up on that desire. So what do you think? What can we tell mothers-to-be about the realities of mothering? Do we tell them anything or do we just hug them later when they cry and tell us they had no idea, why didn’t anyone tell me? 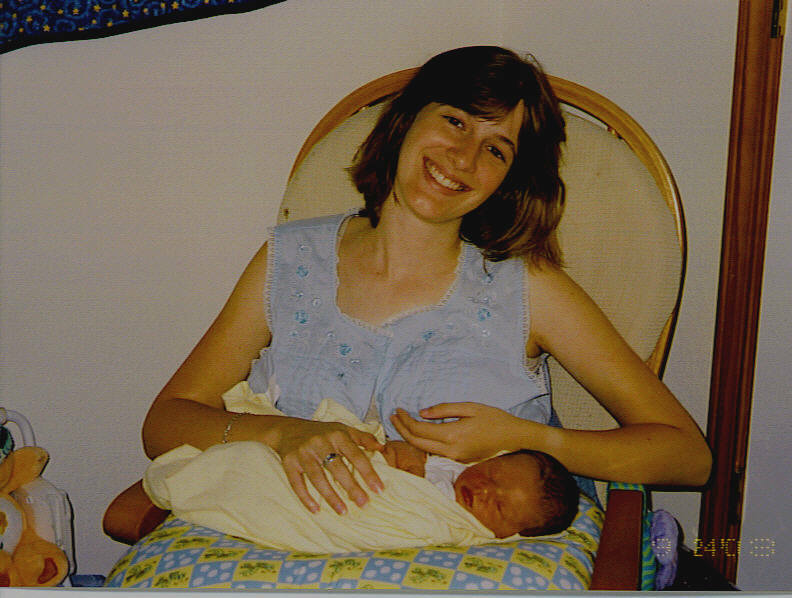 What stories, like that of my own childbirth educator, do you have that you share with clients? Stories are handy ways of imparting life wisdom without being directive or prescriptive, or implying that someone must be exactly like you. I tell my clients a story of reaching out my hand to my husband, our fingers not quite able to touch, and saying, I miss you. I tell them about my feelings of this parenting thing being both more horrible and more wonderful than I ever imagined. I tell them about my childbirth educator running around her house. I give them tips and tips and more tips about making a postpartum plan. And, I tell them they look gorgeous. And, that they’ll be wonderful parents; that their babies are so lucky to have them. I listen to their happy birth plans and celebrate their enthusiasm. I point out how I notice how well they work together and what a great team they are. I wish them beautiful births and happy babymoons and tell them to email me or call me if they need anything. I hope they’ll remember that I’m there and that I do have the capacity to hear “ugly” without rejecting them. I remind them as many times as I can that they’re strong and beautiful and capable…and then, I open my hands and heart and watch them fly away into their own unknown, mysterious, tender, fragile, and precious journey. 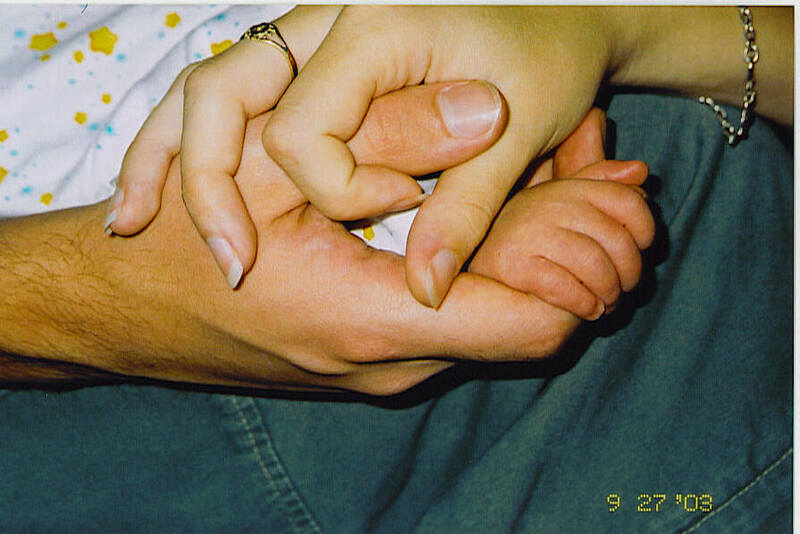 Postpartum hands picture, taken by my mother in 2003. It s like Christmas, the anticipation, the absolute joy. I think it is a lot like life in general, sure there are harsh realities, but until one has lived them, stories told beforehand do not resonate. As the mother of grown daughters, I walk a fine line between educating them about the perils, and allowing them to find their own way. It becomes poignant at this age, because my ability to protect them pretty much comes down to listening and loving them when they bump up against this wonderful and yes, often terribly cruel world. Yes! That’s what I was eventually concluding–that EACH baby brings that Christmas feeling. It isn’t necessarily specific to just the “not knowing” stage of the first time mother. The comment above is from me, Sarah (sharer of Alain’s b-day). I don’t have Facebook, but it is an account I have so I can read others. Sorry. There are things you can’t understand until you experience them. And that is true at every stage of motherhood. When I see my friends with their toddlers I try to remember how completely *annoyed* I was when parents of teens would lament about it not getting easier. Just like I did when I was sick, uncomfortable and finally bed-ridden during pregnancy and people would tell me life with a newborn wouldn’t be easier. I didn’t believe them. And I shouldn’t have. Because the truth is that the hard things are hard in their own way, in their own time but the good things tend to stay with us longer (our brains have evolved this way as a protective mechanism). So, I don’t tell my pregnant friends about the perils of babyhood or my friends with toddlers about how heartbreaking it is when they need you less (because didn’t I *want* them to need me less??). I simply try to allow them the space to feel the ups and downs of each stage (without needing to knowingly tell them about the next one), sharing my own experiences when asked and listening when needed. So glad to have stumbled across this blog! This was such a wonderful post! It’s true that we don’t always talk about the harsh and sometimes ugly reality of motherhood, which may explain why postpartum and maternal depression aren’t widely discussed topics in birthing classes. I think we need to tell them practical things like : how to have a baby moon/lying in and why, the awesomeness of breastfeeding and some tips to get things off to a good start and then be ready with the stories of our own messy truths. I heard a lovely mother speak of turning the radio up during long car trips with a baby. This story and a thousand others sustained me through my own challenging times. I’m the mother of an almost-teen and I tell women “it just keeps getting better” because it is true for me. Thanks for bringing up the question. Coming off of day five with no sleep at night and no ability to “sleep when the baby sleeps” during the day, a 3am crying jag and major breastfeeding woes, I very much needed to read this this morning. I had no illusions that motherhood would be easy, but I never would have anticipated it would be this hard. I couldn’t have anticipated this post partum sadness and the strange feeling of grieving an identity lost and reveling in one gained. My partner doesn’t understand how I can be so in love with our baby yet so strung out and depressed at the same time. It’s always reassuring to read another mother’s experience. Yes, many of us write about it, but that doesn’t mean there isn’t room for more! This is how we do it. Pregnancy is always filled with anticipation and wonder, even a difficult one, and this is why we shouldn’t burst those happy bubbles (in fact, imagine a difficult pregnancy wrought with morning sickness from start to finish without the anticipation and excitement of meeting your perfect baby and starting that ‘magical’ motherhood journey). Putting our stories out there in the blogosphere for teary-eyed and desperate new moms to find at 3am so that they can take comfort in knowing that they are not the first to experience these feelings and certainly won’t be the last, is the best thing we can do (short of holding them while they cry… Hard to do through the Internet). Thanks for this.